Quartz is a silicate dioxide found in many places on Earth. Its main property is to augment clarity of thought. It also amplifies one's intellectual abilities. Tourmalinated Quartz is clear Quartz crystal with tourmalinated inclusions. Citrine is the merchant stone; enables one to attract and hold on to income. Aligns to the Solar Plexus Chakra with the intellectual plane, creating situations that improve upon one's relationship with survival. Enables relaxed, easy breathing, creating a peaceful, calm sensation. Aquamarin is a beautiful greenish-blue gem speaks of courage and leadership. 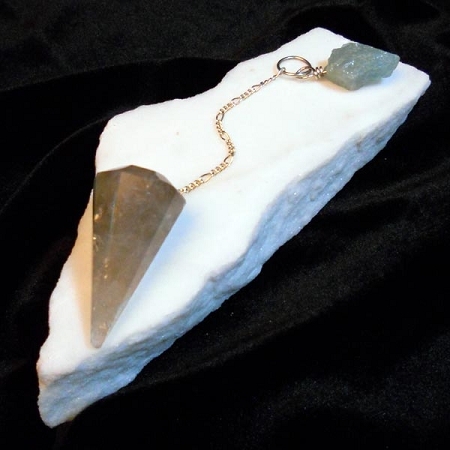 A protection stone for sailors, it combines the gentle soothing essence of the sea with the strength of nature herself. This stone enhances the communication process. It is the traditional birthstone for March.